Dr. Mary Prendergast (Saint Louis University) and Dr. Eren Quintana Morales (Natural History Museum, Paris) will present talks relating to the Sealinks Project’s research in East Africa at the 14th Congress of the Pan-African Archaeological Association and the Society for Africanist Archaeologists meeting in Johannesburg, South Africa, 14-18 July, 2014. Title: Faunal proxies for long-distance trade? 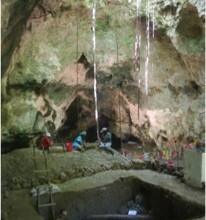 Reevaluating the Swahili coast zooarchaeological record. Authors: Prendergast, M., Morales, E.Q., Crowther, A., Boivin, N., Helm, R. & Horton, M.
Title: Fishing on the Azanian coast: Exploring early East African coastal adaptations through the study of fish remains from first millennium AD sites. Author: Quintana Morales, E.M.